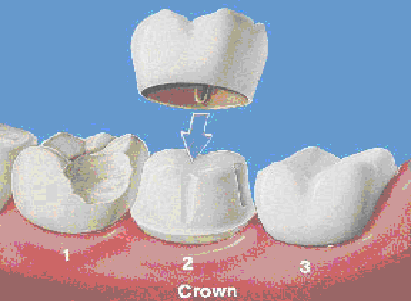 Crowns are used to surround or “cap” a damaged tooth. As well as strengthening a damaged tooth, a crown can be used to improve its appearance, shape or alignment. We use porcelain or ceramic crowns which are matched exactly to the colour of your natural teeth. Crowns are completed over two appointments approximately two weeks apart. At the first appointment the tooth which is being treatment is reduced in size so that the custom made crown can fit over it properly. An impression of your teeth is then taken which is sent to a dental laboratory, who will construct the final crown. A temporary crown is placed to cover the prepared tooth while the work is completed. At the second appointment the temporary crown is removed and the permanent crown is cemented over the prepared tooth. How long to crowns last? They can last a life time however they do sometimes come loose or fall out. The most important thing to ensure that your crown lasts is to keep your teeth as clean as possible. This is done through a mixture of brushing and flossing at home as well as regular cleaning appointments with your dentist.